The flavors of chocolate and peanut butter go together very nicely, especially when you combine the two in a pie! For the crust, combine the graham cracker crumbs and sugar in a mixing bowl. Add melted butter and stir crust ingredients together thoroughly. Press the mixture into the bottom and sides of a 9-inch pie plate. Bake the crust for 8 minutes, then set aside to cool completely. 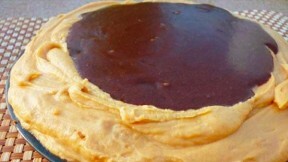 For the filling, mix the cream cheese, peanut butter and sugar together in a large bowl until well-blended. Using a separate mixer bowl, whip the cream with an electric mixer until stiff; fold it into gently into the cream cheese mixture. It’s OK if you see streaks of cream. Spoon the filling into the cooled crust, and, with a spoon, make a smooth circle-shaped depression in the center to hold the chocolate topping. For the topping, combine the sugar and cream in a saucepan and bring to a boil. Reduce the heat and simmer, without stirring, for 6 minutes. Remove the pan from the heat, add the chocolate and butter and stir until melted. Finally stir in the vanilla. Carefully pour the topping over the center of the pie and refrigerate, uncovered, for at least 4 hours or overnight.